Are you looking for the best lightweight vacuum cleaner to help you in your mission to get rid of all that annoying pet hair? Do your pets spill food pellets on the floor and drag dirt and grass inside? Do you need a handheld vacuum to help you with small cleanups? This is NOT a lame listing of available hand vacs in the market. 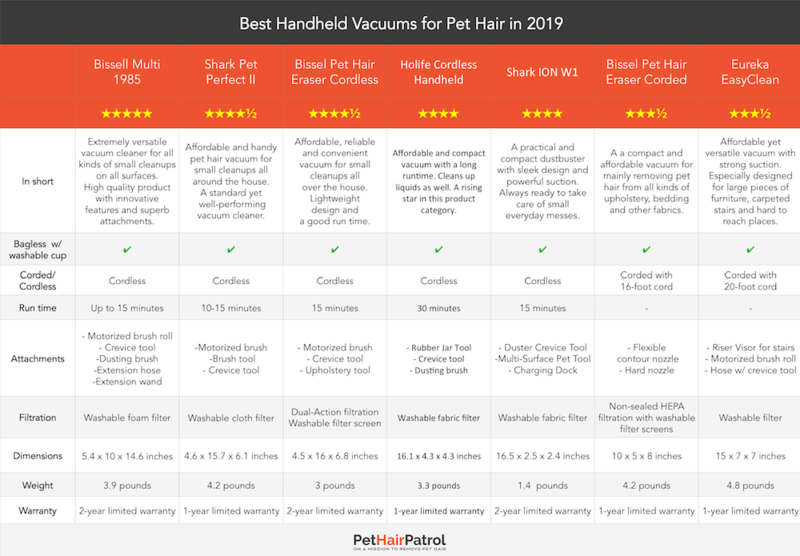 Instead, I've analyzed hundreds of user reviews and interviewed pet owners to discover the best handheld vacuums for pet hair right now. 4 Buying Guide - How to choose hand vac for pet hair? The best cordless handheld vacuum cleaner for pet hair with guaranteed Bissell quality and performance. The editors pick in this category, and most versatile of all vacuums reviewed in this category. Click here to see the latest price. Bissell Multi 1985 is versatile, and it delivers excellent results. It has several innovative and practical features that will benefit pet owners dealing with nasty pet hair, and other messes pets can cause. It is moderately priced and well worth the investment with its capable and easy-to-use engineering. When it comes to performance, the Bissell Multi 1985 gets high ratings. It offers strong suction for up to 15 minutes with its powerful 22V Lithium-Ion battery, and therefore it can efficiently clean up all sorts of dirt. The vacuums itself weighs 3.9 pounds and comes in a compact and sleek design, with a Comfort Soft Grip to add to the comfortable feel when cleaning. Extension hose gives you more reach and LED headlights offer visibility in those tight spots. The dirt cup is adequate at 0.4L but it may need emptying mid vacuuming to prevent clogging if you are dealing with large quantities of shed pet hair. The emptying is done by simply detaching the dirt cup and releasing the bottom above a trash can. Easy and hygienic. The dirt container is washable as is the foam filter inside it. The overall feel of this vacuum is that it is reliable and easy to use. Users report that they have been satisfied with the cleaning results and performance of this product. The Bissell Multi 1985 Handheld Cordless vacuum comes with quite a versatile set of attachments: Dusting Brush, Crevice Tool, Extension Wand With Duster, Flexible Built-in Extension Hose and a Motorized Brush Roll. Some of the attachments are stored onboard the vacuum, which is handy and enables quick changing of tools when needed. You can use the soft Dusting Brush for dust and debris on delicate surfaces, and the Crevice Tool for tight spots. There is also an Extension Wand With Duster, which allows you to reach surfaces high up and clean baseboards without having to bend down. For even more adaptability, you have the Flexible Built-in Extension Hose, which you can use for those hard-to-reach places the extension wand or crevice tool can’t reach. The Bissell Multi 1985 is the editor’s pick in this category for some very good reasons. If you want to beat that pet hair building up everywhere, you need a vacuum cleaner that can manage all surfaces and cracks up high and down low. It has strong suction and good filtration, as well as an easy-to-empty dirt cup. With functional attachments and practical features, this Bissell hand vac is something I can recommend for any pet owner. Best handheld pet hair vacuum for cleaning the car and an affordable all-rounder for any pet owner. Click here to see the latest prices. A fantastic little vacuum for small cleanups all around the house. Works great on pet hair and offers some nice versatility for its price point. With this cordless vacuum, you can take care of all the small messes your pets make. The charging time is long, but this doesn’t create a problem in normal at-home use. The Twister Cyclonic Technology makes sure the suction stays strong even when the dirt cup keeps filling up with pet hair, and the dirt cup is easy to empty and clean when needed. This appliance is not the lightest vacuum in this category, and some users have reported that a swivel head would improve maneuverability, but with this price and performance level, the Pet Perfect II vacuum is a good purchase. Comes with three attachments: the TruePet motorized brush, a brush tool, and a crevice tool. It is not the most versatile of hand vacuums, but it does handle most cleanups without any difficulty. The motorized brush is very efficient when it comes to removing pet hair, dust and dander from carpets, fabrics and also hard surface areas. Stiff bristles lift up the hair from the fabric, and the powerful suction picks it up. The crevice tool can be used to reach all those hard-to-reach places and clean up sand, grass, food pellets or cat litter. 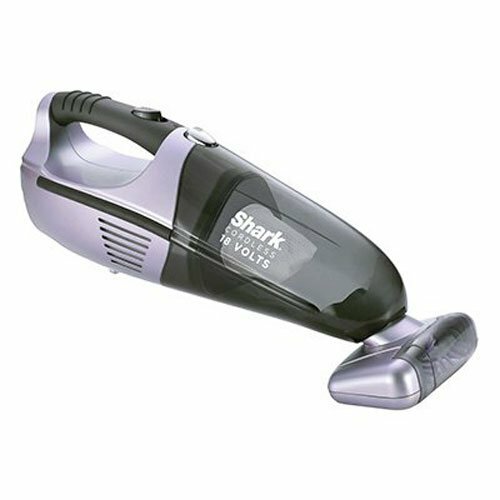 The Shark Pet Perfect II handheld vacuum is a great helper in small daily cleanups. Particularly designed with pet owners in mind, it has some great features that will make cleaning up after pets easier and quicker. 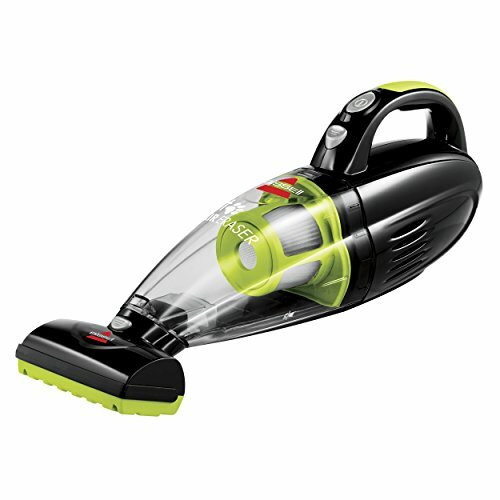 This vacuum is functional and durable, and at this price, it is good value for your money. Best handheld vacuum for cat litter and pet food pellets. A reasonably priced vacuum for all small cleanups at your home. Click here to read real user reviews. An affordable yet adaptable and functional handheld vacuum that helps you keep your house tidy despite the messy pets. Lightweight and easy-to-use design make daily cleanups less of a chore. Because of its lightness, this vacuum is easy to maneuver around furniture and floors – anything from floor to ceiling. And it’s cordless, so you don’t have to worry about plugging it in. The dirt container is huge for a handheld vacuum, meaning it will be a good fit for pet owners with pets that have long hair. The dirt cup is easy to detach for emptying, and you can rinse it with water. This vacuum also has a dual filter with a washable filter screen to protect the paper filter from being clogged by dirt and pet hair. We wish the filter itself were washable, but hey, that’s a pretty small flaw. The detachable motorized foot offers a good strong suction and keeps the vacuum running for 15 minutes on average depending on the tools you use. With a strong suction and three useful attachments, the Pet Hair Eraser is well worth its price. This hand vac comes with three attachments: motorized brush roll, upholstery tool, and crevice tool. These three attachments provide some excellent versatility and allow you to take care of all kinds of small messes no matter what the surface and kind of dirt vacuumed. The brush roll is especially useful at thoroughly cleaning fabrics from dust, dander and pet hair embedded in them. The crevice tool enables you to reach small crevices or vacuum debris such as scattered cat litter and pet food from the floor. You also get the upholstery tool, which has a felt edge that attracts pet hair. This attachment you can use for more delicate fabrics that don’t particularly need the power of the brush roll. The Pet Hair Eraser cordless hand vacuum from Bissell is a functional tool for a pet owner wanting a compact vacuum for small cleanups. It is a pretty basic appliance, but well worth its low price. With this vacuum, you can expect well-known Bissell quality and some nice features for a pet owner. It is a simple yet adaptable and practical vacuum for all those pet-related cleanups and much more. This newcomer is quickly gaining popularity and excellent reviews. It has a fantastic price-quality ratio with all the essential features combined in a compact package with a reasonable price. Click here to see the latest price. This vacuum is one of our top pics because it has a strong suction for picking up pet hair and a reasonably large dirt cup to hold it. It’s lightweight, it has a long runtime, and the dirt cup is easy to empty. This vacuum even cleans up liquids which can be useful if you need to spot clean carpets with liquid detergents after your pet has had an accident inside. This makes it quick and easy to clean up scattered cat litter, dirt brought inside by your pet, or spilled pet food. This Holife handheld vacuum comes with a 2200 mAh battery that provides up to 30 minutes of battery life. It’s cordless which makes it convenient for quick cleanups, and it takes 3-4 hours for it to charge fully which is pretty standard for handheld vacuums. Because the vacuum is cordless and lightweight, it offers excellent usability and convenience in cleaning. The design is ergonomic, and users compliment the vacuum on easy-to-use design. The vacuum is easily emptied by releasing the dust cup, taking out the filter and pouring the contents into the trash bin. The dirt bin is washable as is the filter. The fabric filter is somewhat flimsy but pretty standard in this price range. You do get one spare filter with the package, and more filters are available for purchase online. Just remember to use only water to wash the filter, as detergents may cause damage. The filter is not a HEPA filter, butHolife does have another handheld vacuum that does if you suffer from allergies and need more efficient filtering. The suction in this HEPA vacuum is not as strong, and it can’t vacuum liquids, but otherwise, it is an excellent purchase for pet owners that need that HEPA filter. Although the suction is strong, the Holife vacuum produces only 78dB. This noise reduction feature is great for pet owners because vacuuming often causes stress to sensitive pets. What we love about this vacuum is the fact that in addition to vacuuming dry dirt and debris, it can also clean up liquids. With the special liquid nozzle called the Rubber Jar Tool, the hand vac can vacuum up to 100ml in one go. This feature is useful for pet owners that want to use their hand vac for spot-cleaning carpets after their pet had an accident, or cleaning up spilled water and other wet messes. We would like to see a motorized brush roll tool for pet hair as well, but understandably that would quickly affect the pricing. If you have surfaces like carpeted stairs or suede furniture, you might want to invest in a handheld vacuum that comes with a motorized brush roll. Bissell Multi 1985 and Shark Pet Perfect II are great options for that. That being said the dusting brush and strong suction are able to clean pet hair well, and numerous users give this vacuum excellent ratings as a pet hair vacuum. Finally, the vacuum comes with a charging base which keeps the vacuum at hand and ready to go at all times. This Holife handheld vacuum is a new product in this product category, but it has quickly gained popularity. Users give it excellent ratings and highly praising reviews. It’s not a top-end product, as you probably figured out by the very reasonable pricing, but if you’re looking for a reliable product with all the necessary features and a moderate price, this is the one to go with. A practical and compact dustbuster with sleek design and powerful suction. Always ready to take care of small everyday messes. Click here to read real user reviews. 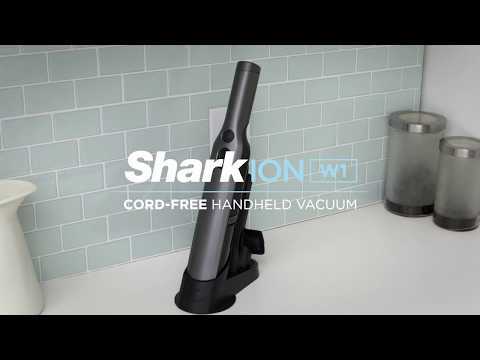 The Shark ION W1 cordless hand vac is very functional and easy to use, and it’s always at hand for small touchups. It will help you keep your house in tip-top shape. The runtime is up to 15 minutes which is pretty standard, although this can go down to 5-9 minutes when using tools on tough surfaces. The charge time for a full charge is only 2.5 hours, which is considerably less than on most other cordless handheld vacuums. The new design is entirely different from traditional compact handheld vacuums. Although the vacuum is very lightweight, it may feel heavier due to its weight distribution. However, with on only 1.4 pounds of weight, this is hardly something that should stop you from choosing this vacuum. The dirt cup is smallish, but on the upside, it is effortless to empty with a push of a button. The single-touch emptying system is quick, easy to use and hygienic. What we also love is the fact that the filter is washable, which saves you the cost and trouble of buying new filters. The lack of a HEPA filter may make people with severe allergies want to consider another hand vac, but for most households, the filtration should be adequate enough. The Ion W1 comes with two attachments: Duster Crevice Tool for dusting and tight spots, and Multi-Surface Tool for upholstery carpets and pet hair. The Crevice Tool adds even better reach for tight spots and attaching the dusting nozzle allows you to carefully dust delicate surfaces and baseboards without crouching over. The Multi-Surface Tool is designed to pick up that persistent pet hair from upholstered furniture and other surfaces. The tool works well on low-pile carpets and most fabrics, but we would recommend a vacuum with a motorized brush roll tool if you have long-haired pets and you need to vacuum thick carpets or furniture with plush upholstery. The vacuum also comes with an ION charging dock which takes care of the fast charging and keeping the vacuum cleaner ready and at hand. The Shark ION W1 is a new addition to the diverse mix of handheld vacuums currently on the market. Its new sleek design sets it apart from other vacuums, and although it is compact and streamlined in design, it offers excellent suction and good performance. It was just recently released, but it has already gained high ratings from pleased users. W1 doesn't come with a brush roll, so it's not ideal for you if you have several long-haired pets. However, if you have cats or small short-haired dogs, and you often use your handheld vacuum for spilled food pellets or other small messes, this vacuum could be ideal for you. What we love most about this vacuum is the easy-to-use design. The idea of this vacuum is always to be ready for use, and that’s a very important feature. Only a user-friendly vacuum that is accessible and easily operated will encourage you to get those messes cleaned up. Other great products we reviewed but which didn't quite make it to the top 5. The best handheld pet hair vacuum for upholstery, bedding, and other fabrics. This compact and affordable yet powerful vacuum is one of the all-time bestselling pet hair vacuums. Click here to see the latest prices. If you are looking for a small handheld vacuum for vacuuming your furniture, bedding, and carpeted stairs, this is your choice. Performs reasonably well on other small jobs too, though mainly aimed for vacuuming fabrics. a pro or a con depending on your preferences. Luckily the 16-feet cord offers a broad reach and strong suction if you just have power outlets in crucial locations. The corded Pet Hair Eraser has a HEPA filter and a washable dirt cup. There is also a washable filter screen to separate pet hair and larger debris and to keep them from clogging the filter. The screen protects the filter from dirt lengthening the lifespan of the replaceable HEPA filter. There are only two attachments, which means this vacuum is not as versatile as other vacuums in this category. But for small messes your pet makes, this is an excellent choice. The Flexible Contour Nozzle is made of rubber attracting pet hair and pulling it up from fabrics for the suction to pick up. This feature is praised by numerous pet owners using this product. You also have a hard plastic nozzle you can use for picking up dirt from other surfaces than fabrics. This attachment combined with a powerful suction does a good job in picking up sand, grass, pet food and such. Another feature every pet owner would find useful. 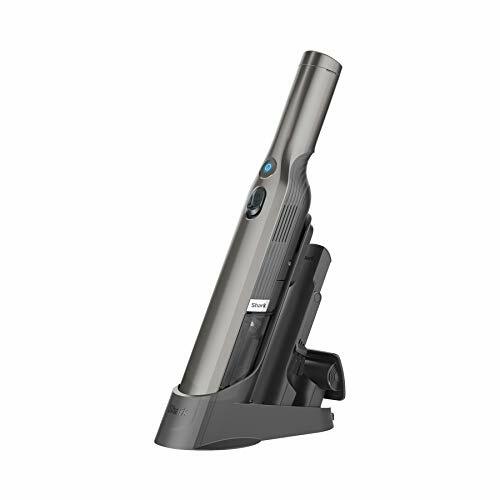 The Bissell Pet Hair Eraser 33A1 is a corded handheld vacuum designed for small cleanups in pet homes. It is the ideal choice for anyone looking for an appliance that can remove pet hair from upholstery and bedding. This vacuum is easily maneuvered across furniture. With a change of attachments, this vacuum cleaner is ready to pick up for example scattered food pellets, wood shavings, sand, and dirt, making it a handy tool for cleaning up after the messes your pets make. Combine all this with a very low price point, and you have yourself an excellent vacuum for small cleaning jobs. The best handheld pet hair vacuum for cleaning carpeted stairs and large pieces of furniture. It is an affordable all-rounder for pet owners and Amazon’s choice in the handheld vacuum category. Click here to see the latest prices. 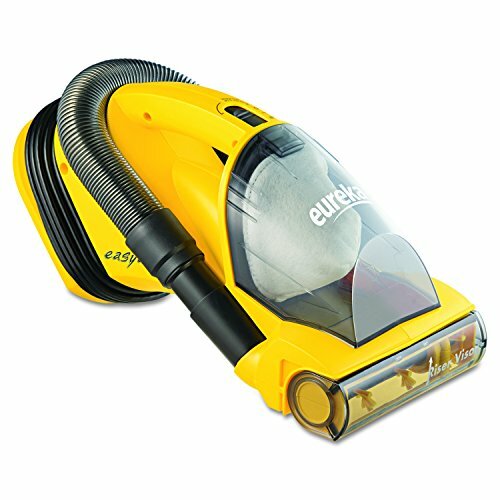 The Eureka EasyClean is not the smallest of handheld vacuums, but it does come with some great power and performance. It can be especially useful for pet owners with carpeted stairs or large pieces of furniture that need efficient pet hair removal. Although a handheld vacuum and a pretty functional all-rounder as such, I did find some criticism aimed at the somewhat bulky design. There are sleeker products in this category, but on the other hand, the wide design allows you to vacuum broader areas with one pass, and that is one of the features that make this vacuum such a handy tool for cleaning furniture and stairs. The dirt cup is easily removed and emptied, and the vacuum comes with a washable and replaceable filter. It also has a very long 20-foot power cord that allows you to move from one room to another without having to unplug. When not used, just wrap the cord around the vacuum and store it away. Some users did wish the cord would have an automatic rewind feature, but the compact design of handheld vacuums doesn’t allow rewind feature space wise. What makes this vacuum a great pet hair vacuum is the strong suction and powerful brush roll, which can also be turned off when needed. The brush roll is powered with its own motor and has stiff bristles making it very efficient in picking up dirt. The flexible hose and crevice tool allows you to reach all corners that need cleaning – may it be on the floor level or in the corners of the ceiling. This vacuum specializes in vertical surfaces with it’s Riser Visor Nozzle Cover feature that allows you to flip the visor of the brush roll depending on whether you’re cleaning horizontal or vertical surfaces. This feature is what makes this vacuum handy with carpeted stairs, couches and other furniture. Not the smallest and lightest of the top products in this category, but with a strong motor it does deliver great results. I would recommend this vacuum to any pet owner looking for a handheld vacuum to use when cleaning carpeted stairs, couches, recliners and picking up dirt left behind by their pets. Affordable yet versatile product with excellent user reviews. Buying Guide - How to choose hand vac for pet hair? Functional attachments are probably the most crucial feature in a good pet hair vacuum. The number one most important attachment for all pet owners is the brush roll. It is the most effective tool in picking up pet hair regardless of the surface. To clean upholstery and carpets thoroughly, it is recommended to have this type of a tool. All of the top 5 vacuums come with crevice tools, that will help you get to that pet hair hiding between cushions and cat litter spilled on the floor. If you want more reach, you should choose a vacuum with a hose, like Eureka EasyClean or Bissell Multi 1985. To find out which attachments come with each handheld vacuum, have a look at our detailed comparison table above. For a vacuum to remove pet hair well, it needs to have sufficient suction power. All of the top 5 handheld vacuums we have picked out have proven their capabilities with pet hair and all other small cleanups. You can choose any of the five vacuum cleaners, and it will have a powerful motor to give it an excellent rating at cleaning performance. We have chosen vacuums at different price points to suit all budgets and needs, but all of the top 5 handheld vacuums have a valid price point and they will offer good value for your investment. As powerful motors and functional attachments are expensive to manufacture, better-performing vacuums tend to be pricier. But that is not to say an affordable vacuum with just the bare essentials wouldn't be the best choice considering your individual needs. You should think about your cleaning needs and figure out which vacuum fits those needs the best. What it comes down to is that if you buy a cheap vacuum that doesn't meet your requirements, it won't be doing you much good and it will be a wasted investment. If you have limited storage space or you need the vacuum to be very light and easily maneuvered, just check our comparison chart to find the smallest and most lightweight models. When it comes to handheld models, the size does matter. Smaller and lighter vacuums will be more convenient to use. Depends entirely on your preferences. If you have power outlets in every room and you are comfortable in changing outlets between vacuuming, then you will get constant power without having to worry about the battery running out by choosing a corded vacuum cleaner. On the other hand, all of the cordless pet hair vacuums we have picked have a sufficient runtime for small cleaning jobs and having a cordless vacuum gives you the freedom to vacuum around your house and car without worrying about power outlets. All of the top 5 handheld vacuums we have introduced have very different filtering systems and filters, but they all blow out clean and fresh exhaust air. Look for a washable filter that can be replaced to cut your costs in the future, and find out if filters can be replaced easily. Most affordable handheld vacuums do not have HEPA filtering, but they still do a good job of cleaning out the exhaust air. If you or your family members have allergies and you want a pet hair vacuum with sealed HEPA filtration to provide extremely clean air free of allergens, you should have a look at the Dyson V6 Mattress handheld vacuum. It is an excellent choice for a pet hair vacuum with many amazing features and top class performance with pet hair, but it just barely didn't make our top 5 because of its high price point. It is a top class handheld vacuum, and it should be your number one choice if you need HEPA filtering to protect the health of your family. Have a look at the attachments to figure out which vacuum you will get the most out of. 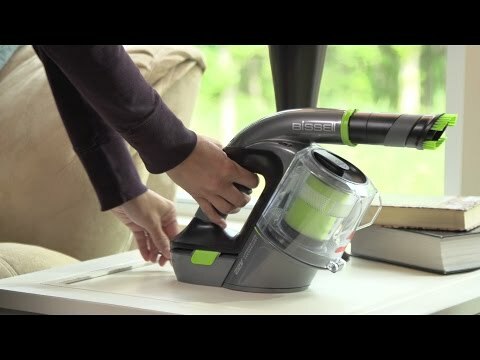 The Bissell Pet Hair Eraser Corded vacuum is great for upholstery, bedding, and curtains, as the Eureka EasyClean is your pick if you have carpeted stairs or many hard to reach places. The Bissell Pet Hair Eraser Corded hand vac and Shark Cordless Pet Perfect are both good all-rounders for all sorts of small cleanups, and the Bissell Multi 1985 has the most versatility and reach of the bunch. Why should I buy a handheld pet hair vacuum? As a pet owner, you are probably aware of the ”pet hair problem.” Most pets shed, and many shed A LOT! Sometimes it seems like your home is slowly but surely filling up with pet hair. Your clothes are wrapped in fluff, and so is your furniture. Pet hair covers the floors and gets wafted into the air all the time. And the stuff that isn’t floating around gathers into huge wads of hair in the corners. It often seems like a hopeless task to keep that pet hair under control. And if you manage to capture some of that pet hair during your weekly vacuuming, there is always more where it came from. It’s an exhausting and neverending battle – if you don’t have the right equipment. You need the right tools for pet hair removal, and handheld cordless vacuums are an essential part of the solution. Having a functional and handy handheld pet vacuum allows you to grab that vacuum every day to do a quick cleanup of those areas that collect the most pet hair. Spending only a few minutes daily on those critical spots will keep your whole house cleaner until you have time for a more thorough vacuuming. A handheld vacuum designed for removing pet hair can really be a game changer. Your guests won’t have to leave your house covered in pet hair because you gave the couch a quick cleanup before they arrived. And your clothes won't be covered in pet hair because there will be a lot less of that annoying fluff in your home. And it’s not just the pet hair that may need cleaning up. The best hand vacuums for pet hair can also pick up scattered cat litter, dirt dragged into the hallway by your pet, or spilled food pellets. A handheld vacuum is something every pet home will benefit from! Is A Handheld Vacuum The Right Choice For Me? A handheld vacuum should be your choice if you are looking for a compact and handy vacuum cleaner for small and specific cleanups, such as vacuuming pet hair off your stairs or furniture, cleaning the car, or vacuuming up spilled pet food or cat litter. If you hate the persistent pet hair that collects everywhere, a handheld vacuum allows you to do a quick cleanup daily to keep that pet hair from accumulating. Stairs, couch, recliner, bed, pet beds and high traffic areas like the kitchen and hallway can easily be kept clean with a convenient hand vacuum. If it’s cordless, it’s even easier to use in the car and other areas with no power outlet. You can even use it for dusting instead of the old fashioned duster that wafts all that dust and hair back into the air. Every pet owner that wants a clean home should have a small and compact vacuum for upkeep cleaning. If you want your home to be in tip-top shape, then it’s the right choice for you as well. How To Choose The Right Handheld Vacuum? You need to think about your needs and preferences. All of these top 5 products are great vacuums, but they have their differences. Would you like the vacuum to be corded or cordless? Do you need to vacuum carpeted stairs and upholstery, or is it mainly floor and wads of pet hair piled up in the corners of your house? Do you need HEPA filters? Just have a look at our comprehensive comparison chart to find the vacuum that has the features suited for your individual needs. These are the top 7 products with the best features and performance, but it is up to you which one is the best choice. It depends on what type of areas and surfaces you need to clean and what type of vacuum you are the most comfortable with. The best vacuum for pet hair is the one that you will be using every day. That is why you should consider not only the features and technical specifications, but also how the vacuum looks and whether you think you would be happy using it. The best handheld pet vacuum is lightweight, efficient, and it has excellent attachments. These 7 vacuums are all a bit different from each other, but they are all wonderful choices if you are looking for the best vacuum cleaner that is compact and can deal with pet hair. To get an idea on how they compare to each other, have a look at the full comparison table. It will help you pick out the best handheld vacuum for pets to fit your needs. What are the essential features for pet hair vacuums? What are the necessary attachments for a pet hair vacuum? Many vacuums also have other add-ons like a wand or hose that will help you clean hard-to-reach areas like between the seat of your car. Some vacuum cleaners also have specialized pet hair tools that have a rubber or felt lining that grabs pet hair. These attachments can be handy, but we would recommend a motorized brush tool as the most efficient tool for removing persistent pet hair from tough surfaces like carpeted stairs or upholstered furniture. We have listed the attachments of the top 7 vacuums on the comparison chart so that you can easily compare them against each other. A handheld vacuum or stick vacuum? Most handheld vacuums are versatile and can take care of many cleaning jobs, but if you need to clean a lot of floor area, a stick vacuum could be a better choice for you. Still compact, and lightweight, stick vacuums have the added benefit of vacuuming a wider floor area with one pass and not having to bend down while doing so. They also often convert to a handheld vacuum and can be only slightly more expensive. If you think a stick vacuum would be the best choice for you, have a look at our Top 5 - Best Stick Vacuums for Pet Hair. 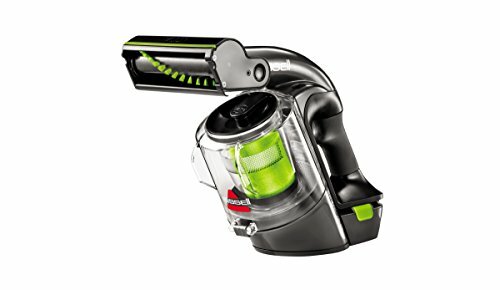 Best handheld vacuum for pet hair on stairs? These vacuums are portable, easy to handle and they are powerful enough to pick up pet hair from carpeted stairs. The Eureka Easy Clean is specially designed for fully carpeted stairs with a Riser-Visor feature that enables you to clean vertical surfaces easily. 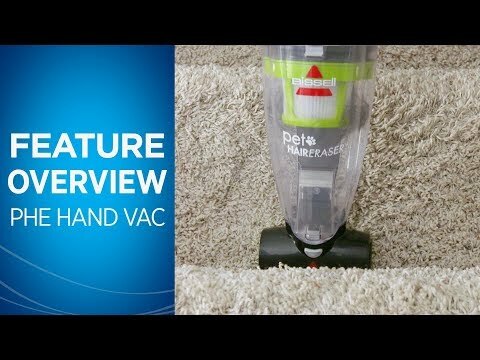 Best handheld vacuum for pet hair and hardwood floors? Since vacuuming pet hair off hardwood floors don’t need a special attachment like vacuuming carpets do, all of the vacuums we have picked as the top choices for pet hair vacuums work on hardwood floors. If you want a compact vacuum for cleaning your hardwood floors AND for taking care of small all-around messes, a stick vacuum could also be a fantastic choice for you. They mostly convert to a handheld vacuum so that you have your small vacuum for quick cleanups, but they also have a long wand and floor attachment for cleaning hardwood floors. It will make vacuuming floors easier because you don’t have to bend over and you can cover more floor area in one pass. Check out our top picks for stick vacuums for pet hair here. Best handheld vacuum cleaner for removing pet hair from bedding? The Bissell Pet Hair Eraser handheld vacuum (with a cord) is considered the best hand vacuum for removing persistent pet hair from the bedding. The Pet Hair Eraser uses its rubber nozzle to attract that pet hair and to pull it into the suction path. If your pet sleeps in the same bed with you, your sheets are probably covered in hair. Pet hair and dander in your bed can cause your allergies to act up, not to mention all the dirt that is carried between the sheets too. In addition to vacuuming your sheets, it’s also important to wash them once a week. If possible, you should also pop them into the drier to get all the pet hair off. Best cordless handheld vacuum for pet hair? A cordless vacuum should definitely be your choice if you are looking for a vacuum cleaner that is always at hand and that can be used in hard-to-reach places. Because you don’t have to deal with the hassle of finding a power outlet and plugging the vacuum in, you’re probably finished with the cleanup in the time that it would have taken to detangle the cord. We recommend cordless vacuums because they are highly convenient. Not long ago these little cordless dustbusters were pretty inefficient and only useful for light cleanup jobs. Today things have changed, and many cordless handheld vacuums have powerful suction and a sufficient runtime. A cordless vacuum is an excellent choice for a handy vacuum that is always ready to deal with small messes. Although we don’t prefer corded vacuums at PetHairPatrol, many people rather have a corded vacuum because you don’t have to worry about the battery running out while cleaning. All of these vacuums are compact, and they are excellent for removing pet hair. If you specifically want a corded vacuum, then you should pick one of them. Best vacuum for pet hair in car? The best car vacuum for pet hair is the Bissell Multi Cordless handheld vacuum. It is portable, and it has sufficient runtime to clean the car. The motorized brush roll attachment removes pet hair for upholstered car seats while the crevice tool, extension hose, and extension wand enable you to reach all those tight crevices and corners. You know the feeling when you drive to work, and you get out of the car with your suit covered in hair? When you have to go to a meeting looking like a yeti? With this cordless hand vacuum, you can keep your car clear of pet hair. 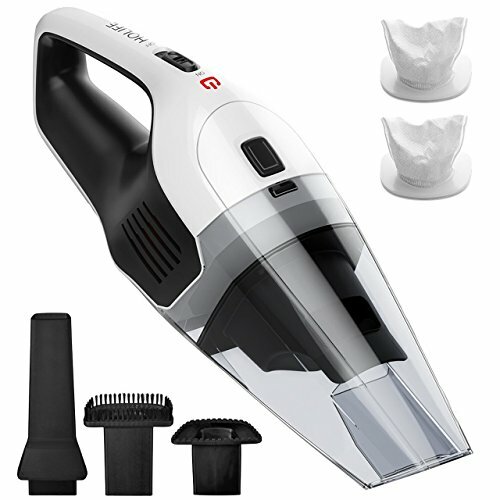 The Bissell Multi is powerful enough to remove not only the pet hair but sand, small gravel, and larger debris as well. The great attachments also make it versatile and enable you to clean all the different surfaces. That’s why it is the best vacuum for pet hair in the car. Best mini vacuums and portable vacuums for pet hair? The best mini vacuum for pet hair is the Shark ION W1. It has a slimline design with a weight of only 1.4 pounds. Because it’s very lightweight and compact, it is incredibly portable and easy to use. Although it’s small in size, it still has excellent suction power, and it performs well on many surfaces. What is the best handheld vacuum cleaner on the market? The best handheld vacuum cleaner on the market is Dyson V10. It has incredible suction power, fantastic attachments and it offers first-rate performance on all kinds of surfaces and with all types of dirt and debris. It is the best hand vacuum right now. Although it is actually sold as a stick vacuum, you can pop off the wand and use it as a handheld vacuum. We have reviewed it as a stick vacuum because it technically is that, but if you are looking for the ultimate handheld vacuum on the market right now, the V10 should be your first choice. If you want to know more about this terrific product, check out our review. Are Small Vacuums Powerful Enough To Do A Thorough Job? Even When They Are Cordless? In the past, many smaller vacuums did not have enough power to do a satisfactory job. But with advances in technology, even many of the smallest battery powered vacuums have great suction power, and they reach excellent results. And this is where we can help you. We have carefully picked the best handheld vacuums for pet hair, which have proven their capability in action with real consumers. These vacuum cleaners here have the best attachments and powerful motors to help you achieve a pet-hair-free home! What about the other handheld vacuums on the market? To pick out the top 7 handheld pet hair vacuums, we carefully chose more than 40 handheld vacuums that were lightweight and compact enough in size to be considered handheld vacuums. We trimmed it down to 15 contestants by reading numerous reviews on each product and comparing the technical specs. Pet hair is one of the most challenging matters to remove from some surfaces, and that is the reason many vacuums were dropped out at this stage. A weak suction or poor performance wasn’t what we were looking for. Next, we did more research to find out everything there is to know about these products. Further examination eliminated a few more contestants, and finally, we had 12 handheld vacuums that had sufficient technical specs and user reviews to back up the promises on the performance. We then tested these vacuums using them on different surfaces and with different types of dirt and debris. The final stage allowed us to trim the list down to 7 vacuums, that could be considered the best handheld vacuum for pet hair based on performance, ease-of-use and price-quality ratio. For example, the Shark Rocket corded handheld vacuum is very popular, but it didn’t make the top list because it is an old model that has been discontinued. We wanted to focus on vacuums that were still in production for our top list to be accurate and up to date. Dirt Devil is another popular brand because of their low prices, but none of their vacuums reached the high standards of performance we were looking for. Dyson, on the other hand, makes excellent stick vacuums that convert into handheld vacuums. Their products have outstanding features and superb performance. They do have a V7 handheld vacuum, which is also top-notch, but Dyson isn’t manufacturing it anymore. It has been replaced by Dyson V8 and V10, but they always come with the wand and floor attachment, and therefore they are not purely handheld vacuums. However, if we were to choose the ultimate handheld vacuum pet owners, it would be the Dyson V10 with the wand detached. It has incredible suction power, great performance and the best features for pet homes. It is the best of the best. But since it’s actually a stick vacuum, you can find it under The Best Stick Vacuums for Pet Hair. Where do I buy handheld vacuums for pet hair? 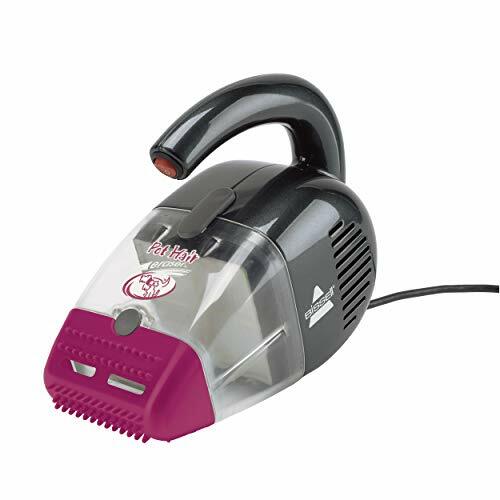 If you are are looking for a pet hair hand vacuum, you might also be wondering where to buy one. You can find pet hand vacuums at most of the largest retailers.